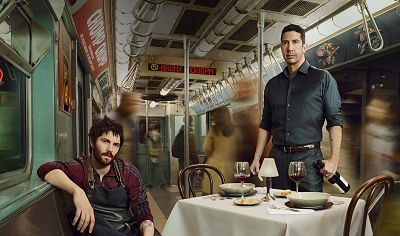 David Schwimmer (TV’s Friends) and Jim Sturgess (Cloud Atlas) star in the AMC drama Feed the Beast: Season One, a drama about two friends who risk it all when they open a high-end restaurant in the Bronx. David Schwimmer and Jim Sturgess star in Feed the Beast. For Tommy (Schwimmer) and Dion (Sturgess), two friends on the brink of losing everything, a dusty pipe dream of opening an upscale restaurant in their hometown of the Bronx is all they have left to turn their lives around. Together, Tommy and Dion take on the insanity of the New York restaurant world, navigating its underbelly of petty criminals, corrupt officials, and violent gangsters.